Lineage. Constituted 862 Bombardment Squadron (Heavy) on 14 Sep 1943. Activated on 1 Nov 1943. Redesignated 862 Bombardment Squadron, Heavy, on 21 Feb 1944. Inactivated on 28 Aug 1945. Consolidated (19 Sep 1985) with the 962 Airborne Early Warning and Control Squadron, which was constituted on 30 Mar 1955. Activated on 8 Jul 1955. Inactivated on 31 Dec 1969. Redesignated: 962 Airborne Warning and Control Support Squadron on 31 Jul 1979; 962 Airborne Warning and Control Squadron on 19 Sep 1985. Activated on 1 Jul 1986. 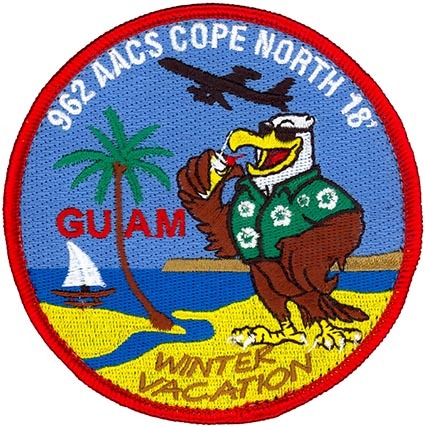 Redesignated 962 Airborne Air Control Squadron on 1 Aug 1994. Assignments. 493 Bombardment Group, 1 Nov 1943-28 Aug 1945 (attached to 3 Air Division, 17 Feb-7 May 1945). 551 Airborne Early Warning and Control Wing, 8 Jul 1955-31 Dec 1969. 28 Air Division, 1 Jul 1986; 552 Operations Group, 29 May 1992; 3 Operations Group, 1 May 1993-. Stations. McCook AAFld, NE, 1 Nov 1943-1 Jan 1944; Elveden Hall, England, 1 Jan 1944; Debach, England, 17 Apr 1944; Wormingford, England, 17 Feb 1945; Debach, England, 18 May-6 Aug 1945; Sioux Falls AAFld, SD, c. 13-28 Aug 1945. Otis AFB, MA, 8 Jul 1955-31 Dec 1969. Elmendorf AFB, AK, 1 Jul 1986-. Aircraft. B-24, 1944; B-17, 1944-1945; P-51, 1945. C/RC/EC-121, 1955-1969. E-3, 1986-. Operations. Combat in ETO, 6 Jun 1944-15 Feb 1945; weather reconnaissance in ETO, 17 Feb-7 May 1945. Airborne surveillance and combat control, 1955-1969. Supported combat operations in Southwest Asia, Jan-Feb 1991. Since 1986, provided airborne command, control and early warning surveillance capabilities to Alaskan theater; supported Alaskan Region of NORAD. In Feb 2001, conducted 3 Wing’s first Air Expeditionary Force (AEF) deployment. Decorations. Air Force Outstanding Unit Awards: 1 Jul 1957-31 Oct 1958; [1 Jul 1986]-31 Mar 1987; 1 Apr 1987-31 Mar 1989; 1 Dec 1989-1 Dec 1991; 1 Apr-30 Sep 1992; 1 Jan 1994-31 Dec 1995; 1 Jan 1996-30 Sep 1998; 1 Jan 2000-31 Dec 2001; 1 Jan 2002-30 Sep 2003; 1 Oct 2003-30 Sep 2005. Emblem. Approved on 23 Oct 1995.